A metal roof is a great choice for its durability, safety and aesthetic. While the cost of metal roofing is more than traditional asphalt, it is affordable when considered as a long-term investment. There are many styles of metal roofing, including vertical panels, standing seam, metal shingles and metal roofing designed to look like traditional tile or slate. Below are the approximate costs of a metal roof, supplied and installed. However, be aware the cost can vary widely from roof to roof, depending on how simple or complicated your roof is. A metal roof with many valleys and dormers will cost much more than a basic pitched roof. Metal roofing can be made from many different materials, including steel, aluminum, copper and zinc. For a residential home, steel and aluminum are the most common type of metal roof. A steel metal roof is the cheapest option, and the most commonly used for residential buildings. The cost of steel shingles are approximately $270 per roof square (a roof square is the standard of roof measurement, and indicates 100 square feet.) A standing seam steel metal roof is approximately $300 per roof square. An aluminum metal roof will cost approximately $100 more a steel metal roof. 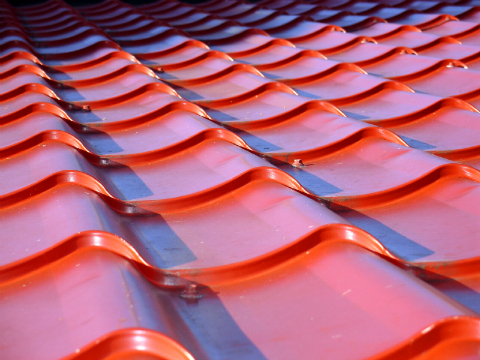 A premium metal roof made of copper or zinc will cost approximately $900 - $1400 per roof square. This material is generally reserved for decorative purposes, and can be seen on many revered national buildings. Every metal roof comes in a different "gauge" or thickness. The gauge will affect the durability of a metal roof. Keep in mind that gauge numbers are in descending order, so .26 is thicker than a .29 gauge. Consult your contractor for the appropriate gauge for your particular regional weather concerns, and your budget. The fastening system will also affect the price. Generally, a metal roof with exposed fastenings or screws will be less expensive than one with concealed fastenings. And of course, the cost of a metal roof will vary depending on your location and the contractor you choose. Every contractor will use different suppliers for their metal roofing materials. Use HomeAdvancement to receive free quotes from qualified contractors in order to get specific numbers geared to your particular needs and location.